Catholic Contextual urban Theology, Mimetic Theory, Contemplative Prayer. And other random ramblings. Someone commented last week that at Bible Book Club we always end up talking about politics! Well, the more we read the Bible, the less we will be surprised at that. Politics is the art or science of government, the state, policy. It is to do with how people live together in society. And the Bible has a lot to say about that. God is the creator of the world, and God’s demands of righteousness, justice and love are constantly coming up against the world as it is. Righteousness, justice and love can seem to be in short supply; suffering and death are found instead. There is nothing in the Bible to suggest that religion is somehow a private interior hobby, to be kept separate from life out there in the world. The Lord’s triumphant entry into Jerusalem on a donkey was both a religious and a political act. So, too, was his death. In Holy Week we read two accounts of the death or “passion” of Jesus. The first, on Palm Sunday, this year is from Mark’s Gospel. The second, on Good Friday, is always John’s account. So we hear two different perspectives on the same events. How do they differ? John tends to bring out the depth and theological meaning of events. John is, so to speak, the view “from above”. We’ll look more at him on Friday. Mark’s is more the account of an observer in the crowd, a view of events “on the level”. But it is still the view of an intelligent observer, who really sees what is going on. In this drama there are the “parties” of the day: not Labour or Conservative, but the chief priests, the Romans, the Herodians, and radical fringe groups like the Zealots. All have their own idea of government and policy, and they are often in conflict. But in the middle is Jesus. He unites these divided parties against himself, because they all see him as a rival. He has his own claim of government, an alternative to them all, the silent victim who stands for a completely different understanding of how the world could be. And Pontius Pilate, the Governor, is of course a career politician. The crowd is getting restive, but he thinks he can win them over. “Do you want me to release for you the King of the Jews?”, he asks, “for he realised that it was out of jealousy that the chief priests had handed him over”. He sees exactly what is going on, the politics, the rivalry at work between the different sides. He thinks he can play one party against another, the priests against the crowd. But the priests have got there before him. 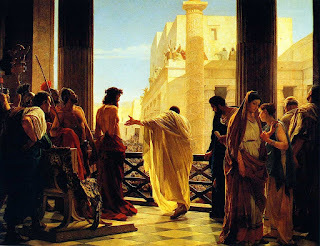 The crowd have turned against Jesus, and Pilate realises that he is on a loser. Being the kind of politician who puts results above principle, he sees that he has to turn against Jesus, too. Never mind the innocence of the victim; a riot is brewing, better give them the victim they demand. And so the story plays out to its bitter end, the lynch mob, roused up by one party, sanctioned by the other, gets its way. The innocent man goes to his death “to satisfy the crowd”. In many ways the death of Jesus is a scene that has been played out over and again throughout history, with many crowds and many victims. The violence of this scene is typically human; God seems distant, almost absent. Almost, but not quite. God is mentioned three times in Mark’s passion story. 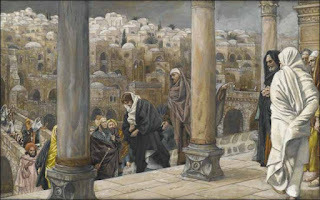 At the trial the High Priest asked Jesus, “Are you the Messiah, the Son of the Blessed One?” A question dripping with irony – the High Priest alludes to God by a euphemism, “the Blessed One”, to avoid the irreverence of mentioning God by name, whilst all the while planning a murder in the name of God. Then, just before the moment of his death, Jesus cries out in the words of Psalm 22, “My God, my God, why have you forsaken me?”. A prayer which underlines the absence of God from the lynch mob that put Jesus to death. At the beginning of the process of killing Jesus, then, God is mentioned by way of blasphemy. And, at the end, by way of absence. It should be clear, then, that the human stuff that takes place in between is not from God. This is made even clearer by the final mention of God in Mark’s passion story: the centurion who when he saw how Jesus died said, “Truly, this was God’s Son!” One of those engaged in the business of killing suddenly sees that everything has been all wrong. Everyone had supposed that God was in the forces of violence aligned against the victim. Had not the priests said that he was a blasphemer? But when it is all over, the centurion suddenly sees, instead, that the victim was God. God has been here in this story all along, but not where we thought. God is there in the one who stands for righteousness, justice and love – even though all the powers-that-be turn against him. God is there in the one who in his suffering and death asks why God has forsaken him. In the middle of the storm of violence. In human politics gone bad. In the darkness of absence and death. God is there, even where God does not seem to be, where we would never think of looking. The story is not over, of course. But for the time being absence and death are what we are left with. Even so, the centurion speaks with the voice of faith, surely a sudden gift, unlooked for, given to the guilty. “Truly this was God’s Son.” The disaster is complete, the loss irrevocable – in human terms. But faith somehow is still there in the darkness. Faith given to the centurion. Faith that burns in the hearts of the women, who go to see where Jesus is buried. And, in the darkness, faith waits. Faith is not a fantasy escape from reality. It does not separate us from engagement with the world in its mess and its trouble. The Bible allows us, indeed requires us, to be absolutely realistic about darkness, absence and loss. The psalms are the prayer book of Israel, and now of the Church, and around a third of the psalms are prayers in dereliction and loss, voices of complaint raised to a seemingly unresponsive God. Like Psalm 22, the only prayer that Jesus utters in Mark’s passion story. False gods, idols, of course need our attention and reassurance all the time. The true God, by contrast, allows us to complain, to lament God’s absence. We are even given the words in which to pray. Because the true God is where we would never put an idol: in the darkness, in the absence, suffering the loss which we ourselves lament. The true God places himself in the midst of the world as it is, with all that goes wrong. That is where faith is given to us, too. And, in the darkness, faith waits. “Stop the world, I want to get off!” We’ve probably all felt something like that, from time to time. The news this past week has highlighted the fragility of life. The nerve agent in Salisbury has shocked us all and led to accusations and threats between the UK and Russia. It is an anxious time. And yet this is nothing compared to other parts of the world. Syria knows all about chemical attacks on civilians. The war in Yemen continues unabated. Migrant boats are sinking in the Mediterranean. Humanity, it seems, is always fragmenting and flying apart. History tells us this is pretty much a normal state of affairs. Humans tends to live by opposition and violence. The unity most often achieved is the false but persuasive unity of us against them. And even our personal lives, our friendships and families, are not immune from this force of fragmentation. So what happens in today’s Gospel reading is really important. Some Greeks in Jerusalem say that they want to see Jesus. And Jesus in response says that now the hour of his glory has come, and when he is lifted up he will draw all people to himself. All people, it could even be translated all things, will be drawn into unity by Jesus. The fragmentation and violence of our history will at last be overcome. 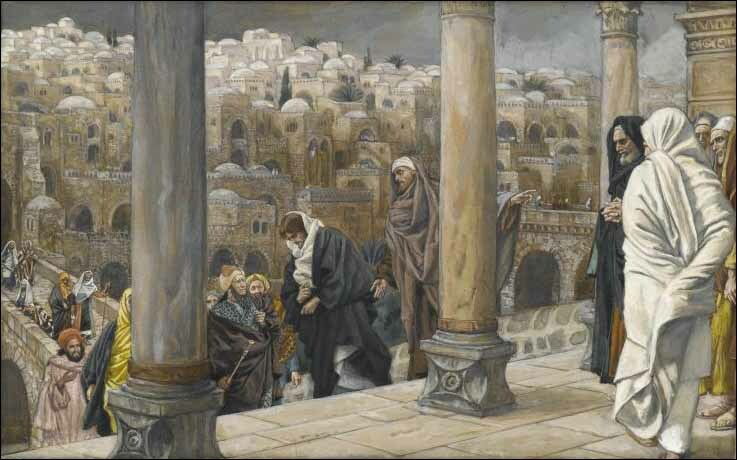 The scene is Jerusalem, just before the last Passover of John’s Gospel, when Jesus will be betrayed and crucified. It is city crammed with people. Jews, of course, but there were also foreigners who found in Judaism something that their ancestral pagan religions lacked, truth and meaning, the living God who is the creator of all things. These foreigners mostly didn’t formally become members of the Jewish faith, but they attended the synagogues, listening to the scriptures and the prayers, and were known as “God fearers”. So today we meet some Greeks, God fearers, who have come to Jerusalem for the Passover. But they find something greater than the Passover: for some reason, they ask to see Jesus. The attraction of this person calls to them. More than the scriptures and the prayers, the temple and the Passover. Long before, Isaiah had prophesied that foreigners would be gathered to worship the one God who had been revealed to Israel: non-Jews, people from the whole world. And now in Jesus that promise is fulfilled. In him the Gentile nations begin to find the one God they have always been seeking. And it is this which prompts Jesus to say, “Now the hour has come”. Until now in John’s gospel we are told that Jesus’ “hour” had not yet come. The “hour” is both his death and his glorification, which in John are the same thing. The cross and resurrection are two sides of the same reality, the mystery by which humanity is redeemed and made new. It is both the judgement of this world, and the gathering of all things into one in Christ. Jesus says, “when I am lifted up from the earth, I will draw all people to myself”. This is truly an inclusive teaching. “I will draw all people to myself.” Not some, but all. No distinction of race or nation or gender or age or sexuality, or anything else. The force of fragmentation and division is overcome. The ruler of this world is driven out. All things will be gathered into unity in Jesus. His power of attraction reaches out to the whole creation. The light, the glory, of God shines forth from the man on the cross, and all peoples are drawn to that light. In place of fragmentation, unity. In place of violence, love. As we heard in last week’s Gospel reading, “the Son of Man must be lifted up, so that whoever believes in him may have eternal life. For God so loved the world that he gave his only Son, so that everyone who believes in him may not perish but may have eternal life”. The light of the cross shows that the deep meaning of our existence is love. We wish to see Jesus, because to see him is to know him, to believe, to live with his life. In him, humanity begins again, gathered into unity, becoming indeed the new body of which Jesus is the Head. “When I am lifted up from the earth, I will draw all people to myself.” The Church is where this new unity in Christ is becoming real, where diverse people from every race and culture and time are formed into one body, one new humanity, in Christ. And what Jesus accomplished once for all through his cross and resurrection is shown forth in every time and place through the sacramental signs he has given to his Church. In the two thousand years since the time of Jesus the Church of the crucified Messiah has been planted in every nation, and day by day more and more people are drawn to him. Here we are, very far removed in time, and place, and culture, from 1st Century Jerusalem. And yet we too are worshipping him, we too would see Jesus. In union with the Church in every time and place we are united with Christ through baptism and celebrate the sacrament of unity, the Eucharist by which we become what we receive, the Body of Christ. It is Jesus himself who does this, uniting believers in every time and place: though we are many, we are one body, because we all share the one bread. Here, even the last and greatest fragmentation of death is overcome. As the risen Christ makes himself known in the breaking of the bread the veils of time and space are stripped away. We worship him, lifted up into the heavens to draw all to himself, with the great communion of saints, with “angels and archangels and the whole company of heaven”. Jesus is the one in whom all nations, all peoples, will be gathered into unity. The church is present in every nation and every culture to bear witness to him, united by the sacraments he has given us to extend his saving work through all time. We are here, we do this as he commanded, not only for ourselves, but for all the world that longs to find its lost unity in him. “We wish to see Jesus.” Andrew and Philip brought the Greeks to Jesus in their own day. We, like them, are to be his ambassadors, bringing people to Jesus in our own time and place. In a world of anxiety and fragmentation, those who have consciously responded to the call to unity in Christ have a part to play. In our worship. In the sacraments we celebrate. In lives that show to the world the sacrificial love of Jesus. If we don’t help people to see Jesus, who will? “As the Father sent me, so I send you”, says the Lord to us. “And when I am lifted up from the earth I will draw all people to myself”. What bites you, cures you. Not, perhaps, the best advice for a hangover – not drinking quite so much in the first place is far better than the “hair of the dog that bit you”. But there is wisdom here, nonetheless. Many ancient cultures recognised this as a medical principle. What bites you, cures you. A small dose cures what would harm you in large amounts. If you had the flu jab this winter that is what was going on: a harmless dose of virus immunises you against the full thing. Today, in the Book of Numbers, the Israelites are bitten by poisonous serpents, but they look at an image of a serpent on a staff and live. This symbol is not confined to ancient Israel. The serpent raised up on a staff is very ancient, and found in many cultures. It is the badge of the Greek god of healing, Aesculapius, and is still seen, for example, on the flag of the World Health Organisation. Snake bite kills you, but there is something powerfully curative there as well. It is a holistic symbol: opposites are at war within, but reconciling them brings harmony. In the Book of Numbers, too, contradictions are resolved. God sends poisonous serpents, but then provides the means for curing their bite. It seems as though God is acting in opposite ways, but we are to see beyond the opposites. The Israelites have turned away from God in rebellion: the bite of the serpents punishes but also corrects, bringing them back to God. What is really wrong with them is their alienation from God, of which the serpents are a visible sign. And God provides the means of overcoming their alienation, in the form of a visible sign. What bites you, cures you. It’s significant, then, that Jesus chooses this episode to illustrate himself. Jesus said to Nicodemus, ‘Just as Moses lifted up the serpent in the wilderness, so must the Son of Man be lifted up, that whoever believes in him may have eternal life’. Jesus is the cure for the bite of the poisonous serpent, the devil who brings death. But somehow his being lifted up also shows us what the problem is. The problem is the culture of death that, one way or another, puts people on crosses. Jesus was killed by religious people, the powers that be, who thought that he threatened them. He became a scapegoat, an expendable person, as summed up by Caiaphas, in John Chapter 11: “it is better for you to have one man die for the people than to have the whole nation destroyed”. The death of Jesus was the small dose of violence, inflicted on an outsider, in an attempt to save the group from the greater violence that would destroy them. That’s how human beings tend to function. But we’ve got it all wrong. The fundamental human problem is that we turn away from the God of life towards death. This is what we call sin. At the root of it is our disordered desire, as we saw last week in the ten commandments. Instead of desiring God, who gives us life without limit, we desire what other people have got, and think we have to take it. There may not be enough life to go round, so grab it while you can, and make sure other people don’t. This is the snake that bites us, the poison that torments us. One way or another, all sin comes down to this: failing to believe that God really gives life without limit. God gives us himself, showing us his love. God gives us the man on the cross, who shows us what we are, what we have been. This is the snake that bites you, this putting people on crosses, and all that it represents. But this is also what cures you, because it is God’s love in the very place where we seek death. We have turned away from God to cast out the scapegoat, and, lo!, the scapegoat is God, turned towards us. Loving us. Desiring us. Unmerited, unearned. Redemption, salvation, the cure of sin, the gift of eternal life. Eternal life is the life that God lives. Eternal life is not this passing life, carried on indefinitely. It is something other, the life of God, who is outside of time. It is life without limit. This passing life is limited, and we know what that is like. Eternal life, God’s life, is outside our experience. It has to be given to us from beyond. We have to be “born again” or “born from above”, as Jesus says to Nicodemus. And this is grace, gift, freely given. To receive it, we simply have to turn to Jesus and believe in him. Those who believe in him are not condemned; they will do what is true, and come to the light. Grace is so simple. And yet it seems so difficult! It seems too good to be true! Even Christians struggle to believe it. Does God really just give us all we need, even God’s own life, eternal life? Just because that’s what God is like? Yes, God does. But we try to resist. Our old human nature keeps telling us that there has got to be a catch. Yes, grace, but. But we’ve still got to earn God’s favour somehow. God can’t really be that good. “I don’t receive communion, I’m not good enough.” “I must try harder, I don’t want to let God down.” “Maybe if I say more prayers God will notice me.” All these things have been said, to me, by Christians. And I dare say there is something similar whispering such things inside of me, too. It takes a lifetime, really, to get used to the fact that God means what God says. “I’m not good enough.” That has nothing to do with it. What matters is that Jesus is good enough. Receive, then, the gift that he longs to give you. “I don’t want to let God down.” God, as St Paul says today, “loved us even when we were dead through our trespasses, [and] made us alive together with Christ”. Now it’s obvious that dead people can’t earn anything, least of all their own resurrection. That is what grace is. As freely given as resurrection given to the dead. Why do we suppose that grace is some kind of bargain, as if God could possibly need anything from us in return? And, trying to make God notice us. Look at the cross. God has noticed us. What bites you, cures you. Opposites are at war within us: sin and death; God and life. The poisonous bite of sin should make us look to Jesus, who shows us both the problem and its cure. God loves us. For no reason at all, except that that is what God is like. God raised us to life when we were dead in our sins, utterly helpless. As sheer gift. Because that is what God is like. It is Jesus, lifted up on the cross, who shows us this. It is Jesus who cures us. That is the heart of the Gospel. Believe in Jesus, accept the free gift of grace, and live. And, as we tend to pinch ourselves, and think that this can’t really quite be true, it does no harm to hear and proclaim that message again, and again.